Nominated in 2017 for Best Off Broadway Play, Daddy Issues tells the story of Donald who is trying to live his life as a gay man in 1980s in New York. His parents are in denial about his lifestyle, disapprove of his career choice, and question his flair for decoration. Donald is always upfront about being gay but to get his family to stop kvetching, Donald needs a son. With the help of his ballsy best friend (Henrietta) and rising drag queen (Levi) Donald hires the ten-year-old kid from downstairs to play his son. But what could go wrong? This fast-paced new comedy, from the wit of David Goldyn, takes audiences on a rollicking risqué ride to remind us just how far we’ll go for family. Daddy Issues comes to the Willow Theater (300 S Military Trail, Boca Raton, FL 33486) on March 1 – 10, 2019. For more information go to www.DaddyIssuesThePlay.com or www.WillowTheatre.org/Daddy-Issues or call (561) 347-3948. OutClique magazine talked to David Goldyn, the show’s director and producer. OutClique: So, tell us up front, is the show hilarious and why? David: This is based on a true story that happened to me. My parents always knew I was gay but they were relentless in wanting a grandson. I mean relentless! To get them off my back once and for all, I told them I had an out of wedlock son with a girlfriend I had in college. They wanted to meet the son immediately if not sooner. In real life, I kept this charade up for 45 minutes. In the play, I have this charade going on for over a week. Donald’s need to please his parents, and the parents need to have a grandchild at any cost creates all of the elements of farce: mistaken identity, little white lies, cross dressing, and door-slamming. It’s a total crowd pleaser. Who can’t relate to trying to please one’s parents? OCQ: What is your favorite part of the show? David: My favorite part of the play is the happy ending which you will have to see to believe. Who doesn’t love a happy ending! If only life could have happy endings! Massages can have happy endings, but life is tricky. OCQ: Are you allowed to tell us if Donald resolves things with his parents? David: Yes and no. Are parents ever satisfied? I’ll explain. One critic in New York called it, “a sitcom waiting to happen.” Daddy Issues has subsequently been in sitcom development. The need for Donald to please his parents and himself goes on for more than 24 episodes in my sitcom outline of episodes. So stay tuned for the sitcom where things are resolved but things are not resolved. OCQ: What’s it like being both Jewish and gay? OCQ: How have previous audiences received Daddy Issues? David: They loved it but in different ways. In New York we had a largely cosmopolitan and often straight audience and they laughed at the situations and the jokes but think some of the gay humor went over their heads. In Orlando, it was a gay theatre and the audience got all of the gay jokes. 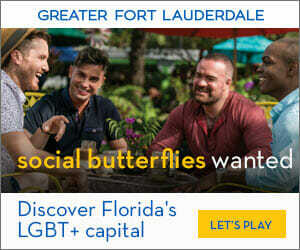 One critic said this is a unique play that could please a gay theatre audience as well as a senior citizen condo! 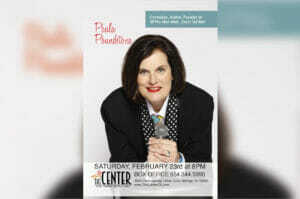 It’s the risque show you can bring grandma and the kids to as well as a date. 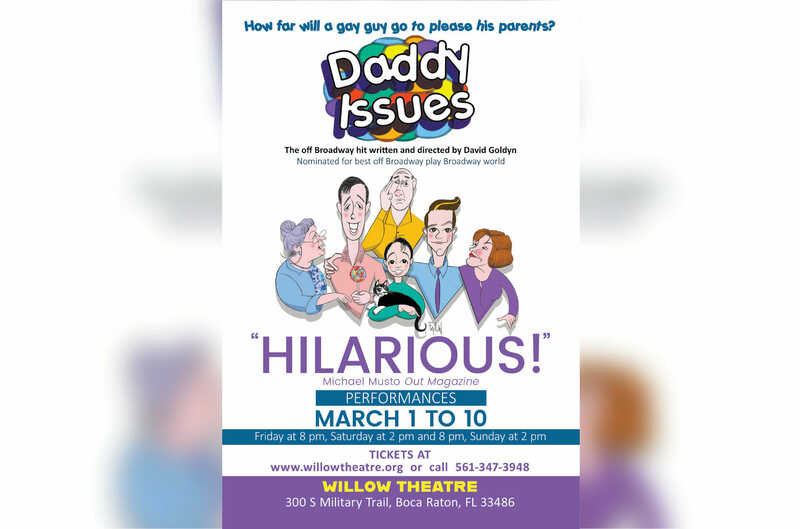 Get your tickets today for Daddy Issues, playing the Willow Theater in Boca Raton, March 1 – 10, 2019.